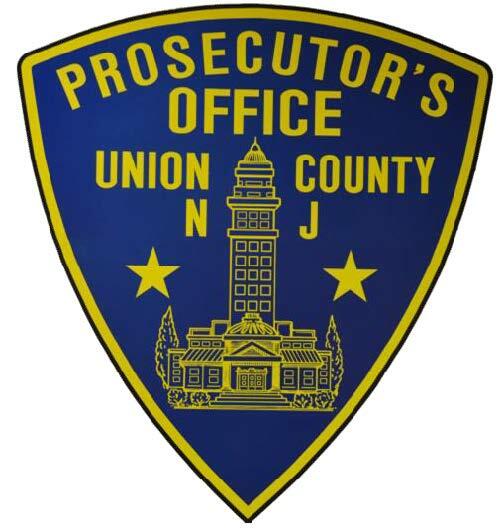 Following months of planning, Union County is poised to become the first county in New Jersey that is exclusively patrolled by local law enforcement to have all of its departments outfitted with body-worn cameras, acting Union County Prosecutor Michael A. Monahan announced Thursday. 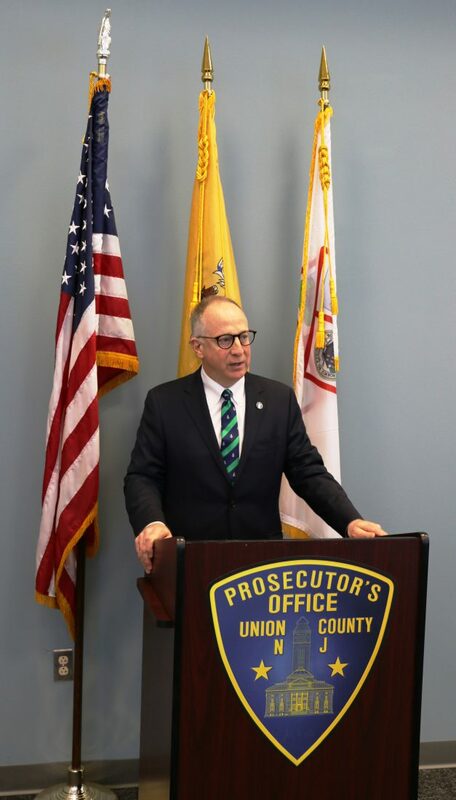 Prosecutor Monahan, who earlier this year launched an initiative to ensure full countywide implementation, was joined today by county officials and most of Union County’s 21 municipal police chiefs at the Andrew K. Ruotolo Justice Center in downtown Elizabeth to mark the occasion. The Prosecutor’s Office distributed approximately $181,000 of its forfeiture funds to six municipal police departments in 2018 to cover significant shares of their first-year startup costs for their body-worn cameras, ancillary equipment, and file storage. All of those departments are currently in various active stages of body-worn camera deployment, a process anticipated to be completed early in 2019. Thursday’s announcement comes a little more than three years after the Prosecutor’s Office launched what to that point was New Jersey’s largest county-funded, multi-municipality body-worn camera pilot program of its kind, with nine departments signing up for the initial rollout in late 2015. The remaining departments in Union County independently implemented body-worn cameras at various points during the next several years. The New Jersey Attorney General’s Office awarded 15 police departments in Union County a total of $376,500 to purchase body-worn cameras as part of past funding programs that offered over $3 million to police agencies across the state to acquire the devices. The first directive issued by Attorney General Grewal after taking office established a policy that made body- and dash-camera videos of police deadly force incidents subject to public release, following a formal request, once the initial investigation of the incident is substantially complete, typically within 20 days of the incident. The body-worn cameras used by patrol officers throughout Union County are activated at the start of calls for service – officer safety permitting – and during any on-duty encounter with a civilian, with several exceptions for certain situations and in sensitive venues such as schools or houses of worship. Circumstances in which the cameras are in use include traffic stops, vehicle searches, arrests, and more. During the course of each workday, officers also “tag” their videos electronically, filing them into different categories, and this can be accomplished using a variety of devices, from smart phones to laptops. Once each officer returns to police headquarters following a shift, he or she removes their camera and places it in a docking station; at that point the footage is uploaded to cloud storage or local servers while the device also recharges automatically. Union County Board of Chosen Freeholders Chairman Sergio Granados also joined Prosecutor Monahan and the police chiefs Thursday to voice his support. Prosecutor Monahan thanked all of the municipal elected officials who approved funding for future body-worn camera costs, as well as all of the local chiefs – including Union County Police Chief Chris Debbie, Union County Public Safety Director Andrew Moran, Union County Sheriff Peter Corvelli, Berkeley Heights Police Chief John DiPasquale, Clark Police Chief Pedro Matos, Cranford Police Chief Ryan Greco, Elizabeth Police Chief John Brennan and Public Safety Director James Cosgrove, Fanwood Police Chief Richard Trigo, Garwood Police Chief James Wright, Hillside Police Chief Vincent Ricciardi, Kean University Police Director Mark Farsi, Kenilworth Police Chief John Zimmerman, Linden Police Chief David Hart, Mountainside Police Officer-in-Charge Joseph Giannuzzi, New Providence Police Chief Anthony Buccelli Jr., Plainfield Police Director Carl Riley, Rahway Police Chief John Rodger, Roselle Police Chief Brian Barnes, Roselle Park Police Chief Paul Morrison, Scotch Plains Police Chief Theodore Conley, Springfield Police Chief John Cook, Summit Police Chief Robert Weck, Westfield Police Chief Christopher Battiloro, Winfield Police Chief Walter Berg, and Union Township Police Director Daniel Zieser. The New Jersey Office of the Attorney General in July 2015 issued a 24-page directive governing the use of body-worn cameras by law enforcement statewide; it can be viewed in its entirety online. Back row (left to right): Plainfield Police Director Carl Riley, Springfield Police Chief John Cook, Roselle Police Chief Brian Barnes, Hillside Police Chief Vincent Ricciardi, Mountainside Police Officer-in-Charge Joseph Giannuzzi, Winfield Police Chief Walter Berg, Union County Sheriff Peter Corvelli, Kenilworth Police Chief John Zimmerman, Berkeley Heights Police Chief John DiPasquale, Scotch Plains Police Chief Theodore Conley, Kean University Police Director Mark Farsi. 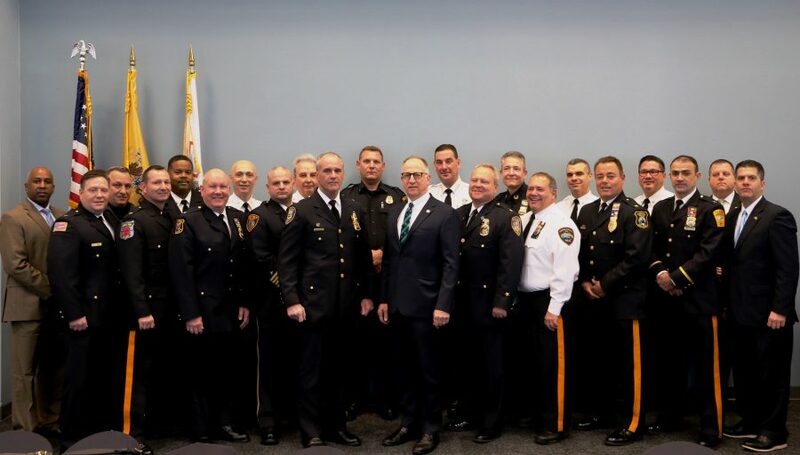 Front row (left to right): Garwood Police Chief James Wright, Roselle Park Police Lt. David Pitts, Linden Police Chief David Hart, Westfield Police Chief Christopher Battiloro, Elizabeth Police Chief John Brennan, acting Union County Prosecutor Michael A. Monahan, Rahway Police Chief John Rodger, Union County Police Chief Chris Debbie, Fanwood Police Chief Richard Trigo, Clark Police Chief Pedro Matos, Union County Prosecutor’s Office Chief of Detectives Vincent G. Gagliardi. Additionally, at far left are Union County Freeholders Angel Estrada and Bette Jane Kowalski, as well as County Manager Edward Oatman; at far right is Freeholders Chairman Sergio Granados. Law enforcement leaders from across Union County gather at the Andrew K. Ruotolo Justice Center in Elizabeth to mark the full countywide implementation of body-worn cameras.